Animal Care Services officer Martin Londoño with an injured barn owl. Courtesy photo. 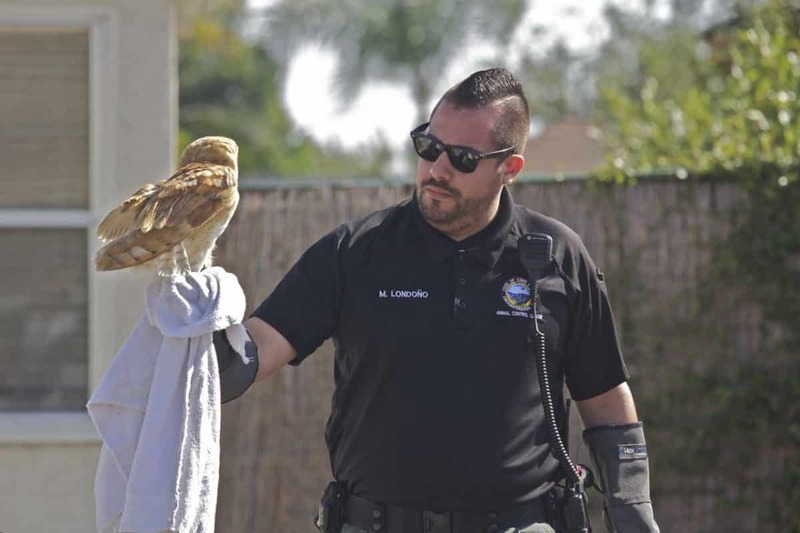 Long Beach Animal Care Services officer Martin Londoño responded to a call in the Traffic Circle area regarding a downed barn owl on Wednesday afternoon. The nocturnal raptor was crumpled up in a backyard with an injured wing. “It’s not uncommon to find injured owls in Long Beach,” said Animal Care Services manager Ted Stevens. “Our officer picked it up and took it to Long Beach Animal Hospital,” whose veterinarians are specially trained to administer to a broad range of wildlife. The barn owl seemed no worse for the collision with a tree or power line and seemed content to be driven to the hospital to have its wing fixed.